A few weeks ago I was casually strolling through downtown Toronto and it seemed that everywhere I went this cookbook made an appearance. I love dining out (regular SukasaStyle followers already know that from the various restaurant reviews posted on the site). And since Toronto offers one of the most vibrant and varied food scenes in the world, the foodie temptation in me runs wild to keep up with the best of the best. When I’m having the same ‘ol boring dish at home, while binge watching my favourite Food Network TV shows, I am constantly in wonder of why I can’t cook like the master chefs. Well until now. My first sighting of Toronto Cooks: 100 Signature Recipes from the City’s Best Restaurants was the massive display at the flagship Bay store downtown. Author Amy Rosen has compiled the best of the best chef recipes in one cookbook. One hundred of them. I feel like I’ve just been handed a key to get into foodie heaven. 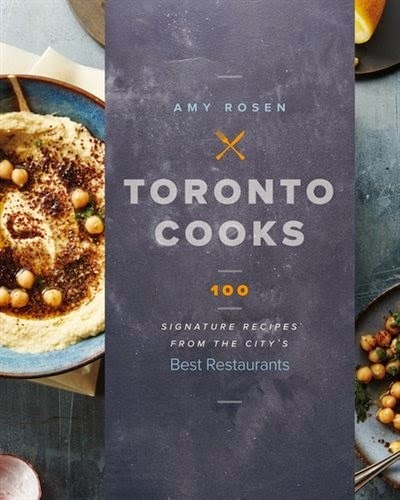 Why would fancy Toronto restaurants chefs reveal their secrets goes beyond my comprehension, but before they decide to change their minds and take the devoured cookbook off the shelves, I was determined to have a copy (or two, or three…it’s the holiday gift giving time after all). But, I decided I would keep it at the back of my mind and not indulge in an impulsive purchase. I scurried around the Eaton Centre making a pit stop at another one of my favourite stores Chapters Indigo, and low and behold, right at the entrance was a tower…of none other than Toronto Cooks: 100 Signature Recipes from the City’s Best Restaurants. Was this a sign? The excitement was already building in me, and I thought of at least 5 of my foodie friends who would absolutely love this book. Grabbing a few copies I made a beeline for the cashier. To give you a bit of hints about the secrets this cookbook contains. How about Lynn Crawford’s Braised Short Ribs, or Momofuku’s Milk Bar Crack Pie®, or Bymark’s Fennel-Crusted Black Cod. Yes, this is the perfect book for food lovers who want to recreate the recipes from some of their favourite restaurants. And, with holiday parties just around the corner, there’s sure to be a recipe in here to impress just about any discerning guest (like a mom-in-law!). Published by Figure 1 Publishing Inc. and distributed in Canada by Raincoast Books.